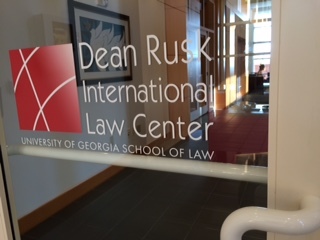 We’re looking for a self-initiating, globally minded individual to lead the Global Practice Preparation portfolio here at the Dean Rusk International Law Center, University of Georgia School of Law. The Associate Director for Global Practice Preparation will advance our 40-year-old Center’s mission by developing and administering global practice preparation initiatives, with the support of an administrative assistant and under the supervision of yours truly, the Director of the Dean Rusk International Law Center. A J.D. or LL.M. degree or its equivalent is required for this possession. As detailed in the full job notice, the successful applicant also will have significant experience, practice- or research-based, in global affairs, international law, and/or global legal education; proficiency in languages other than English; and experience in events planning and coordination. The successful applicant further will have an ability to travel, as well as a demonstrated self-initiating, entrepreneurial, creative, and collaborative approach to work. Also expected is dedicated to advancing the mission of the Dean Rusk International Law Center. Named after the former U.S. Secretary of State who taught at Georgia Law in the last decades of his career, the Center has served since 1977 as a nucleus for global research, education, and service. We look forward to filling this vital position asap, so if you’re interested, don’t delay!